In their Fall 2011 issue, Moviemaker proclaimed the Sebastopol Documentary Film Festival (SDFF) as one of the "can't miss cool fests of 2011" and SDFF wears that laurel proudly, continuing to bring independent film to West Sonoma County for their fifth edition, which kicks off March 29 and continues through April 1, 2012. "Community is key at this doc fest," writes Moviemaker, "which serves as a catalyst for strengthening the local film community, developing an independent moviemaking program for nearby youth and eventually launching a year-round series of cinema screenings, salons and workshops." My thanks to SDFF Program Director Jason Perdue for sitting down to discuss the festival's continuing growth, indicated this year by a multi-page program, an official opening night with reception, and new screening venues. Michael Guillén: The proliferation of film festivals has been a subject of concern in recent years. What encouraged you to take on the challenge of creating a new film festival in an area inundated with film festivals? Jason Perdue: That wasn't even part of the consideration, really. At the time that the festival's original founder Eliza Hemenway and the Sebastopol Center for the Arts decided to create SDFF, that concern wasn't necessarily the case. In Sonoma there was the Sonoma Valley Film Festival—which later became the Sonoma International Film Festival—and the nearby Mill Valley Film Festival. They were the two main festivals. Since then, several smaller niche festivals like our's have popped up; but, the key to our survival has been that—since the beginning—it was a documentary-only film festival. Documentaries are what inspired us and gave us passion and focus as programmers, and this has carried over to our audiences who have a love for documentaries. Guillén: At what point did you take over from Eliza Hemenway? Perdue: Eliza not only founded the festival but—in that first year—pretty much did everything. She set up the partnership with the Sebastopol Center for the Arts. By the time I got on board, she had been planning the festival with them for several months. She had just opened the call for entries and needed help taking a look at the first films. Guillén: So you were on a screening committee? Perdue: That's right. We helped her plan the event, but she already had it pretty much mapped out. She had secured the venue and had a shell of a website and four or five of us were brought in to help her screen the incoming entries. Guillén: What was your background in film? How did you end up on that screening committee? Perdue: I was really just a huge film festival fan. The first film festival I ever attended was the San Francisco International; a friend brought me to the closing night entry Crooklyn (1994) and Spike Lee was in the audience. I was instantly addicted. I was living in San Francisco at the time, working at the Stock Exchange, when I discovered many of the other community-based film festivals, as well as programming at the Roxie—IndieFest kicked into gear in the mid-'90s—but, I was just a consumer. I was just in the audience watching films and had my ideas of what did and did not work at these programs and always had in the back of my mind that programming a film festival would be a cool thing to do. But I didn't have any access and didn't know anything about putting on a film festival. Still, it became a passionate hobby. I would take weeks off to attend film festivals, became a benefactor of the San Francisco Film Society so I could take advantage of press screenings and one year saw more than a hundred movies; I was obsessed. So it was through that experience of attending film festivals that I developed my understanding of how festivals should work, at least from an audience standpoint. I didn't know anything about projection or filmmaking or even film criticism. I just knew what I liked or didn't like. Guillén: So as a consummate cinephile, Eliza pulled you in to help her screen films and organize the festival. Then at one point you became the programming director yourself. It's perhaps obvious, but why did you decide to take on that role? Perdue: I don't want to speak for Eliza, but after that first year of pretty much doing everything on her own, with some assistance from a core group of volunteers, she didn't want to go into a second year without divvying out duties. She wanted someone to at least take over as Program Director to organize the call for entries, to organize the screening committee and how films would be parceled out for consideration, to determine what the program was going to be and to make it happen. She wanted to be involved in other ways and having that piece of the festival off her plate would help her a lot. She put this out into the group and everyone didn't know what to do or say, but, after a couple of days I realized I wanted to try it. I volunteered and everyone said, "Great!" Guillén: How fortuitous! I'm sure you recognize in retrospect that the opportunity to program a festival is a dream position for many people? Perdue: Yeah, but here's the thing. We started from nothing and we had no contacts with other festivals so it wasn't like the word went out to the festival world. There were just four or five of us who knew that one of us was going to do what we considered to be basically a secretarial position. We didn't think of it as a coveted position. We had no plans of bringing in anyone from the outside. I will admit, however, that the moment I put the title "Program Director" under my name, my eyes opened to the opportunities for access. Guillén: How important was the involvement of the Sebastopol Center for the Arts in helping you further this festival? Perdue: The Sebastopol Center for the Arts is a 25+-year nonprofit institution in the town of Sebastopol that has tons of members, high visibility, and puts on events that a lot of people know about. Branding the festival back to the Sebastopol Center for the Arts was an ongoing challenge. A lot of people came to the festival in its first few years without any understanding that the festival was a program of the Center for the Arts; but, I'm confident the co-branding is now firm. Thus, the Executive Director of the SDFF is the Executive Director of the Sebastopol Center for the Arts (Linda Galletta). That relationship has allowed the festival to make it. The Center had a history of curating events; they had a built-in membership base interested in their events; and they had an established infrastructure of box office and volunteer coordination. Due to that, the SDFF didn't have to reinvent the wheel just to get started. Further, as a fiscally-tight organization, the Sebastopol Center for the Arts has taught me a lot about how to run the festival in the sense that you don't spend a penny until you've brought it in. You don't make promises to organizations and individuals that you can't actually pay for.Guillén: I imagine working under the aegis of an established arts center has likewise helped in securing corporate sponsorship? Perdue: Having a nonprofit status carries a certain cachet in corporate sponsorship and marketing spheres. They want to have their brand associated with an event in that nonprofit space, especially an event that's popular in the community. Guillén: With the documentary genre as your niche focus, how did you strengthen that identity? Perdue: Shortly after becoming the Program Director and sending out the call for entries, I got an email from a documentary filmmaker asking if I could waive the entry fee for his film? He described his film and I liked the sound of it so I agreed to waive the fee in exchange for his helping me to promote the festival in documentary circles. He promised to post information about SDFF to the D-Word, which is a website / bulletin board / social network—though it was created before that term came into existence—of documentary professionals that come together to support and help each other. When he told me about it, I joined up as a member and began promoting my event. Then filmmakers who screened at SDFF went back to this environment to report on the experience. They said, "Sebastopol is doing something special here." That was immensely meaningful for me and inspired me to continue. Guillén: "Sebastopol is doing something special here." And then Moviemaker called you one of the coolest film festivals of 2011. Why? What had you done to distinguish yourselves? What makes SDFF "cool"? Perdue: From the first year and every year since, it's always been about the programming; about finding the best films that we can and not pandering to the audience or worrying about premiere status or if the film has already shown in other festivals or if it's already available on Netflix. If we feel a film is a great film that has probably not been seen by most of our audience, we'll program it. When the filmmakers came to the festival and found the company they were in and began interacting with other filmmakers—many who had already won awards and done well with their films at other festivals—it proved an important experience to them. Our audience appreciated that they were being given a curated group of films, not a random group of films. Guillén: I like that. A lot could be said about the distinction between programming films and curating films. When I first glanced through your glossy new program guide for your fifth edition of the festival, one of the first things that struck me was that the programming was a mix between new and tried-and-true films. 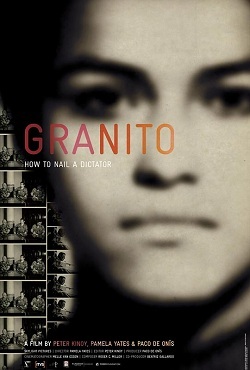 Case in point: your Latino program spotlights the investigative work of Pamela Yates, which includes her invaluable 1983 entry When the Mountains Tremble coupled with her most recent film Granito: How To Nail A Dictator (2011). As value added, Yates will be in attendance at your festival to discuss both her films. Perdue: We've built a precedent for that kind of programming. In a previous edition we had the 25-year anniversary of Word Is Out (1977) with the entire directing crew present. My co-creative directors are both filmmakers who take the history of documentary film seriously—especially in the Bay Area where they're very much entrenched—and they don't want to lose touch with that. We have always managed to honor that history in some way. Guillén: Let's talk about some of the other entries in this year's festival. Opening night is Mark Cousins' The First Movie (2009). Perdue: It's a great film. I saw The First Movie at Silverdocs last year and immediately as soon as it was over said, "I've got to get that film." But let me be clear, all the members of the SDFF programming staff keep their eyes and ears open about what's coming up but we make no promises to anyone. If I see the greatest film I've ever seen at Silverdocs with my programming staff 3000 miles away, I will never tell a filmmaker, "We're going to show your film." Never. Because programming for SDFF is a collaborative effort. Guillén: Did you know even then that it would be your opening night film? Perdue: Not really. This is the first year that we're doing an opening night event with one film in a big venue where everybody's seeing the same film. We've never done that before. The first four years we showed four or five films in small venues all around town and then everybody came together for the opening night reception afterwards. So this is a little bit of an experiment for us. Guillén: It's more a traditional structure to a film festival: opening night, centerpiece, closing night. Perdue: I feel we've been bringing a film festival experience to Sebastopol in a lot of ways by bringing in filmmakers, bringing in films of various subjects, creating opportunities for conversation with the audience, creating the party environments, but the one thing we didn't have was the opening night experience. There's a difference between seeing a film with 100 people than seeing a film with 500 people and the opening night experience is something I wanted to bring to Sebastopol. Guillén: Tell me about your special program "Peer Pitch". Perdue: Peer Pitch comes from a Washington, D.C.-based organization called Docs in Progress, run for several years by Erica Ginsberg. As the title of the organization implies, they help documentaries that are in progress from the beginning stages of "I have an idea. I've sketched out this. I've shot this few minutes or hours and I'm not sure exactly what to do next" to "I'm almost done with this but I need some advice on how to either distribute or edit it or put the finishing touches on it." 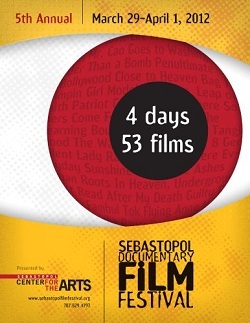 Docs in Progress works with filmmakers through classes. Every year Silverdocs schedules a Docs in Progress program called Peer Pitch, where they invite participants to do a no-pressure pitch of their work to a group of other filmmakers for feedback. I participated in Peer Pitch at Silverdocs this year and befriended Erica and—as I was preparing my festival—she said, "What do you think about bringing Peer Pitch to the West Coast?" I thought it was a great idea. I've opened up the space but she's pretty much organized the entire thing. She's rounded up the media and is running it as she runs it. People are signing up for it. It's definitely new for the North Bay. Guillén: I firmly believe in the cross-pollination of ideas between film festivals to develop film culture, so I'm supportive of this collaboration between SDFF and Docs in Progress. Now, I don't intend to make you go film by film through this year's program, but what do you really want audiences to catch this year? 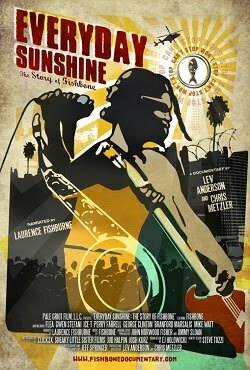 Perdue: I think our closing night film Everyday Sunshine: The Story of Fishbone (2010) is going to be huge. We're staging it at Hopmonk Tavern, which is the local venue where big bands come to play. We'll show the movie in the venue, then take down the screen, and then the band will perform in concert right afterwards. We're really excited about that. Fishbone was a band that was one of my favorites in the mid to late eighties. I went to several of their concerts in the Bay Area. We're partnering with Claypool Cellars, the winery owned by Les Claypool, who's the lead singer and bass player for the band Primus, and is featured in the film. Guillén: Sounds like a blast, Jason! Thanks for taking the time to talk with me today and I wish you the best with SDFF: 4 days with 53 films! 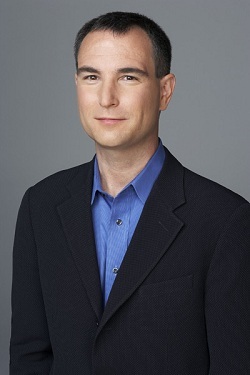 I first met Charles ("Charlie") Tabesh, the Senior Vice President of Programming for Turner Classic Movies (TCM), when Tabesh and Robert Osborne attended the 2007 summer edition of the San Francisco Silent Film Festival (SFSFF). Not only was Osborne on hand to introduce Camille (1921), but—on behalf of TCM—he accepted SFSFF's commendation to TCM for their continuing contributions to the silent film genre. At that time I asked Charlie Tabesh to talk about TCM's commitment to the silent film genre and he replied: "As far as the silent film programming and why we do it and why it's important to us, there are three things I can think of off the top of my head that really explain it: One, we are not ad-supported. As a programmer, that's great because it gives us all sorts of flexibility and it allows us to not do things that advertisers would want to try to reach a mass audience, or whatever. Strategically, then, doing something niche like silent film, gives us really passionate advocates for the channel because we're the only place you can get it. There are a lot of people all over the country where the only way you're going to see a silent film is on Turner Classic Movies and that's really key because then you have those people going to their cable affiliates saying, 'I really want TCM. Give me TCM.' From a business perspective, that really helps us. It helps us and we're not hurt by the fact that it's very niche because we don't have to worry about advertisers. That's really good. "The second thing on that is that our general programming strategy and philosophy is we're the history of movies. We're the history of the film and we're the place to go to learn about it. Of course, that means sometimes that includes newer films and people might complain when we play a newer film, but that also includes silent films. You can't be the history of movies and not include silent movies. [Third,] to narrow that further, we're also very much about context. We don't just put movies up on there; everything is themed and there is an idea or a reason behind it. So not only are we about film history, but in the way we look at film history by looking at actors, or directors, or various themes. No matter what theme you do—if you're doing romantic comedies—silent film is a part of that. They're actors and actresses that were both in silent films and sound films and—if we're going to do a tribute to Garbo—we're going to show both her silent and sound films. Silent films are a piece of film history and that's what TCM is all about." 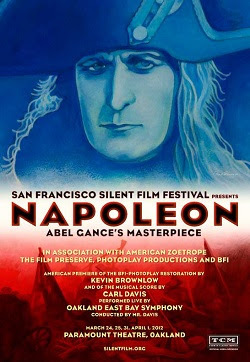 When it was announced in January that TCM had signed on to be the media sponsor for SFSFF's upcoming international premiere of Abel Gance's Napoléon (1927), fully-restored by Kevin Brownlow with the original score by Carl Davis, I was delighted and contacted Charlie Tabesh to congratulate TCM. My thanks to Heather Sautter for facilitating our recent conversation. Michael Guillén: Charlie, thanks for taking a few minutes this morning to talk to me about the international premiere of Abel Gance's Napoléon. You are no stranger to interacting with the San Francisco Silent Film Festival. I first met you and Robert Osborne back in July of 2007 when you were brought out to San Francisco to be honored by SFSFF for Turner Classic Movies (TCM) silent film programming on Sunday nights. Charlie Tabesh: That was great. It was really a fantastic experience. Guillén: In January of this year SFSFF announced that TCM had signed on to be the official media sponsor for the Napoléon premiere. Can you talk to how that came about? Tabesh: We are friendly and have a good relationship with the various people that are putting it on, both people from SFSFF and Patrick Stanbury and Kevin Brownlow, all of who are working on the project. They approached us about being partners and for TCM this Napoléon premiere is such an important event for film lovers and for film history that we really wanted to be affiliated and associated with it. We figured out a way to work with them and I'm really glad. Guillén: What does TCM's involvement as an official media sponsor actually entail? Tabesh: Well, that's not really my area. That gets into the marketing department and how they handle the sponsorship. I know we've done some programming on air in support of it. There was some Napoléon-themed programming in January around it to help talk about it and there will be Abel Gance films coming up in March to lead people into it. Guillén: Will TCM in any way be filming the event? Or doing any interstitial footage of the event? Tabesh: No, we won't be filming, partly because the legal rights—as you know—are what have kept this film out of circulation for so long. Filming around the event would be problematic and so we aren't planning on doing that. Guillén: We've spoken before about TCM's silent film programming and discussed TCM's Young Composers initiative. Is that initiative still in effect? Tabesh: No. We don't do that particular program any longer. It was a great experience and a great program for us but, to be honest, it was very expensive. But TCM is still funding the scoring of silent films. Guillén: I'm aware that the third edition of the TCM Classic Film Festival in Hollywood is coming up soon. Do you screen silent films there? Tabesh: We've programmed silent films the last two years and we will continue to do so this year. Every year we do silent films. Some are big name well-known films and others are more obscure; but, we do have a silent film program. Guillén: One of the things we discussed when you were in San Francisco was after Robert Osborne commented that the appreciation of silent cinema appears to be a bit stronger on the West Coast due to an advantageous time zone. Your Sunday night programming hits us at prime time, whereas it's airing at midnight on the East Coast. Has that issue ever been addressed? Tabesh: You're exactly right and that's still true. It's a challenge. Anything we do is a bit of a challenge because we have one feed. It's true that the silent films are smackdab in prime time for the West Coast. The one thing that has maybe changed since we last talked is the prevalence of DVRs so that our audience on the East Coast can now tape the silent films if midnight is too late for them. Again, that applies to all things that we do. We have an 8:00 franchise on Saturday nights that is perfect for the East Coast but it's maybe a little bit early for the West Coast. TCM has to try to balance that and make each coast as happy as we can. Guillén: In recent years I've been intrigued to witness this resurgence of interest in silent cinema, of which TCM has clearly played a part. Do you have any thoughts on why there has been this rekindled interest in silent cinema? Tabesh: I hope that's true that TCM has had something to do with that. The only thing I can think of is consistency. We've stayed with silent cinema and it's always been part of our mission so maybe just over time people have had the opportunity to catch some silent programming on air and discovered they're really good films. Initially, when you're not used to it, when it's not something you're familiar with, you might put up a little bit of a block and say, "I don't want to sit there and watch a silent movie. What do you mean no dialogue?" But once you give it a try, you're hooked, depending on the film and what your own tastes are. It's great that a movie like The Artist (2011) has helped to revive an interest in silent film. Guillén: Can you speak to the amount and/or the quality of silent films TCM has in their library? Tabesh: Within the Turner library itself we have the MGM and the Warner Brothers silents. Not all of them are in great shape so we've gone through a process of determining which materials are good and what we can save, preserve and score from that list. We also work with various studios whose films we license and we work with a lot of independent companies like Milestone Films, Kino and Jeff Mosino from Flicker Alley who has helped fund a lot of great restoration work. A lot of what we do is directly from the library that Ted Turner bought a few years ago, and a lot of what we do is working with these other companies that are as passionate about silent film who are putting them out on DVD. TCM is their television partner in a lot of cases. It just depends on the project. Sometimes Jeff will approach us and he's so passionate about a particular project and is persuasive enough that TCM goes, "Sold. Let's do it." A good example would be J'Accuse! (1919), the Abel Gance film that TCM will be screening [on Sunday, March 18, 9:00PM PT]. TCM funded that restoration some years ago. We can't do all of the restoration of silent films, but we can do quite a bit. Guillén: I recall when the newly-restored print of J'Accuse! was screened at SFSFF in 2009. I wasn't aware that TCM was involved in that restoration; but, it's great to hear. I was actually going to ask if TCM has screened any Abel Gance films on the network? 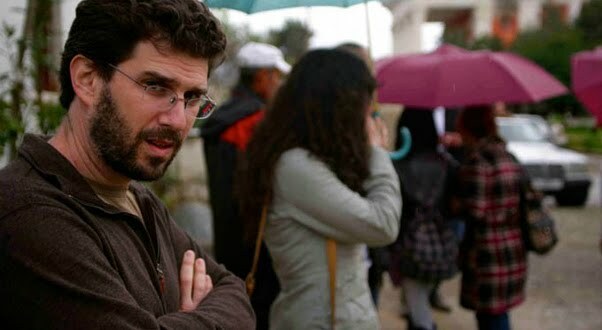 Tabesh: We've screened J'Accuse! and La Roue (1923) and a version of Napoléon, but not the version that will be screening in the Bay Area. Guillén: Will there be any chance of Brownlow's current restoration of Napoléon ever being screened on TCM? Tabesh: It's so complicated. I hope we can someday; but, for right now, it's a long shot that it would be done anytime soon. Guillén: All the more reason to catch the Paramount screening! Another wonderful feature of TCM's programming is your invitation to guest hosts to educate audiences about film. Will you have Brownlow or Carl Davis on TCM to speak about silent cinema? Tabesh: It's funny you ask that. I was just thinking yesterday—not specifically about that idea—but, thinking about doing something with film historians and having them come on TCM. I don't know. Both Brownlow and Davis are in London, you know. We had Kevin Brownlow out last year at the TCM Classic Film Festival and I was really hoping that Carl Davis—when he was out in San Francisco—would stick around and come to our festival too; but, unfortunately, he's not going to be able to do that. I'm hoping we can invite him out next year or some time down the line. If we can get them here and set up a time for them to co-host movies on TCM, I would love to make that work, with them or other historians. Guillén: Charlies, thanks again for taking the time today. I want to congratulate TCM on its continuing support of silent cinema. It was fantastic to hear that you signed on to be the media sponsor for the Napoléon screening and—if I don't see you at The Paramount—I will certainly see you in Hollywood at the Classic Film Festival. Tabesh: Oh good! I'm really glad. My thanks to Michael Hawley for uploading his footage of the recent Q&A session for Patrick Wang’s In the Family at the 30th edition of the San Francisco International Asian American Film Festival (SFIAFF). With the inaugural Sun Valley Film Festival (SVFF) less than a week away, Festival Director Sabina Dana Plasse has announced the festival's full schedule. 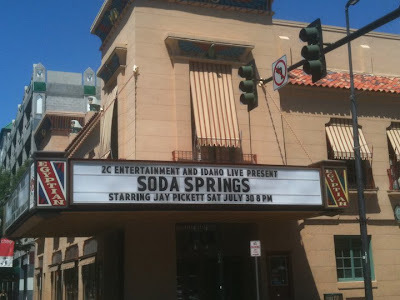 Included among SVFF's slate of dramatic features is Soda Springs (2012), co-produced, co-written and starring Idaho native Jay Pickett, whose handsome performance as prodigal son Eden centers the film. Soda Springs is solidly directed by Michael Feifer and sports Jeffrey D. Smith's accomplished cinematography of Idaho's beloved sagebrush desert country. There isn't a single dishonest note in any of the film's performances, including a heartbreaking appearance by veteran actor Tom Skerritt as Eden's father. A classic narrative about fathers and sons, mentors, and guiding spirits, Soda Springs speaks to classic—nearly mythic—themes of sacrifice and redemption and is sure to be a crowd pleaser at its Lantern 1 screening on Saturday, March 17, 1:45PM. Pickett will be in attendance to Q&A with his audience. 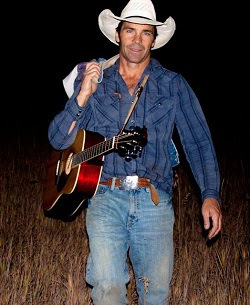 Actor / screenwriter Jay Pickett grew up on a ranch in Caldwell, Idaho in a close-knit family with four siblings. 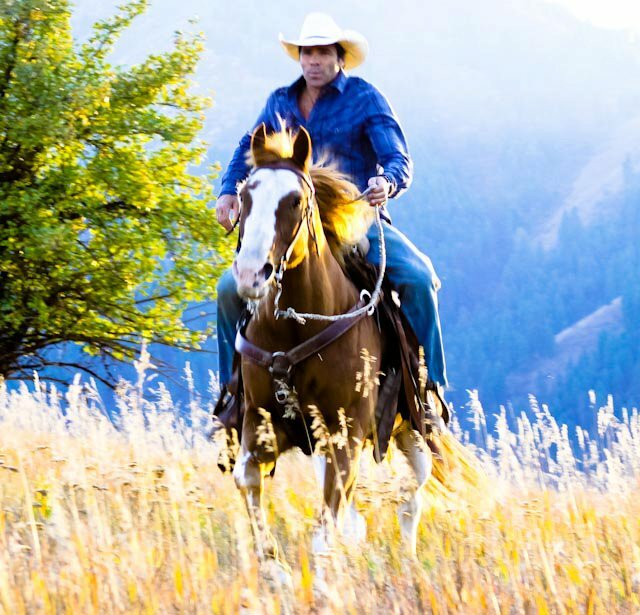 Sports and rodeo took up the majority of his time during his youth, even as he felt a pull in another direction. A graduate of Caldwell's Vallivue High School, Pickett pursued a Theatre Arts degree from Boise State and then headed south to Los Angeles where he earned a Masters of Fine Arts Degree from UCLA. 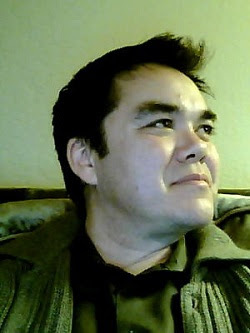 Michael Guillén: Let's talk about your origins in Caldwell, Idaho before we launch into discussing your return to Idaho to accompany Soda Springs to the inaugural Sun Valley Film Festival. It's my understanding that your ease with horsemanship in Soda Springs came about from a background in ranching and rodeo work? Jay Pickett: Yeah, that's right. I basically grew up on a ranch and started riding horses at an early age, probably two or three. I started competing in rodeos when I was seven or eight years old. All my brothers and sisters competed. I went through the ranks of the junior rodeos, high school rodeos, and college rodeos, on into amateur professional rodeos. So, yeah, I have a long background around horses. Guillén: And yet you began to want more than a ranching life in Caldwell? What drove you to veer away towards acting? Pickett: I always felt a pull in another direction, even though it was hard to define back then. 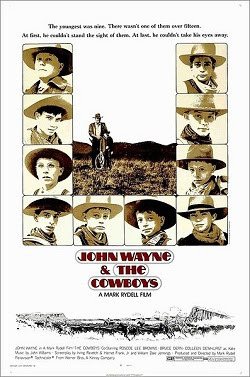 I remember watching John Wayne in The Cowboys (1972) where he had this crew of kids on horseback. I can't remember the movie that well, but I do remember at the time I thought, "That would be the coolest thing in the world to be able to do something like that." So I was really young when I already felt that pull towards acting and performance, but it was something I couldn't really nail down. I took some theater classes in high school where I started playing around with it; but it wasn't until I went to college at Boise State that I began to think about it seriously. I had one professor Fred Norman who was a mentor and he helped me make the decision. He said, "If you really like this, you should commit to it because you're good at it." So I did that. I changed my major and pulled my focus away from rodeo and football and made acting my primary thing. I never looked back after that. Guillén: And you've done quite well over the years. You've done a respectable amount of TV work, even in series I'd seen you in without yet knowing who you were. Guillén: Yeah, like in Desperate Housewives (where you roughed up Orson). It's always interesting to me when an actor blips on my radar and I look back and realize how they've shaped their careers. Soda Springs is definitely, however, the vehicle that brought you to my attention and which, I imagine, will bring you to the attention of others. Pickett: I sincerely hope so, Michael. That's been the plan. Briefly, I went to UCLA and I was pretty lucky early on. I started working shortly after I graduated with my Masters degree. I spent a long time on soap operas but I felt that they weren't going to get me where I needed to go. I knew I had to find another way to promote myself and to get myself out there. I thought the best way to do that would be to tell my own stories and so that started me down the path of making my own movie. Guillén: One of the taglines for Soda Springs is: "Coming home is easy. It's staying that's the hard part." I've taken that tagline as an overarching comment on the state of film culture and filmmaking within Idaho, perhaps because I still feel very much an outsider. Though I was born in Nampa and raised in Twin, I left shortly after high school and have spent most of my adult life in San Francisco. So my perception of film and festival culture is fairly urban and international, even though I'm observing Idaho's film scene and its regional aesthetics with considerable interest and curiosity. 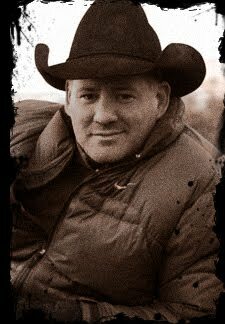 Your career exemplifies what I consider the ongoing conundrum in Idaho with regard to film talent. To achieve opportunity, you had to leave Idaho? Pickett: You're exactly right. I did have to leave Idaho, but going back to make a film in Idaho reminded me that I've always had a fondness for Idaho. I love the state and am proud to be from the state. My producing partner for Soda Springs, Gary Hollie, felt the same way. He's also from Idaho. We both dreamed of going back there to shoot a film; but, there's not a lot of film production in Idaho, so it was difficult. There's not a lot of incentive. I don't know all the ins and outs—we were a lean production and weren't looking for a lot of incentives or anything—our plan was to film in Idaho just because we wanted to go back. But to respond to your question, you have to sometimes go away and learn. Even though I know the film industry is spreading out across the country, there's still so much going on in L.A. and it's where you can learn. You're around a lot of other talented people. Then you can take what you've learned and go back "home" and spread what you've learned around. Guillén: Did you always have in mind that this script for this story was going to be set in Idaho? Did you always intend to return to Idaho to make your first feature? Pickett: Yeah, that was always our primary objective: we wanted to go back. As I said, I love Idaho. It's a beautiful state. I have so much family there that I could call on for favors—which I did—and not just family but friends came out of the wood work. We were overwhelmed by the generosity of the people of Idaho and it truly was the experience of a lifetime, Michael. There will never be another experience like making your first film. There were so many synchronicities and happy accidents that happened along the way and I think that good vibe, that good energy, shows up in the movie. We used folks from both places. We brought people from L.A. and they worked so well with the people we found in Idaho. 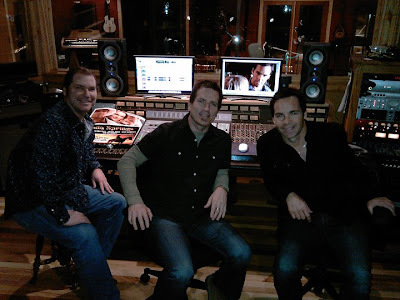 Steve Fulton, the talented musician who scored our film, went to high school with me and my producing partner Garry Hollie. We wanted to involve people who we knew from our past. Our cinematographer Jeff Smith—who did such a great job—he's from Pocatello and went to Boise State, even though I didn't know him in Idaho; I met him here in L.A. He was the perfect choice to take back with us. Guillén: I like how you talk about the generosity of the people from Idaho in contrast to the state, perhaps, not having the financial incentives in place that most filmmakers would seek out in trying to make a film there. You're not the first person to mention how important a role this generosity has played in making a low-budget film in Idaho. This generosity is one of the main calling cards the state has to draw in production. Can you talk a bit about how you coordinated that production? 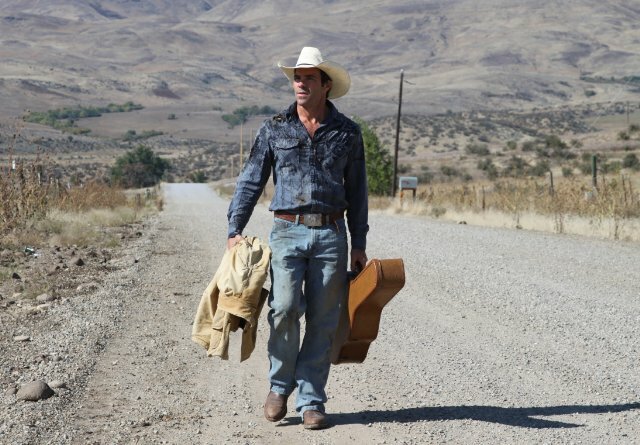 Did you go through the Idaho Film Office to find local talent? Or was it more through word of mouth and personal contacts? Pickett: It was a little of both. We worked with Peg Owens and she helped point us in the right direction in a number of different ways. She helped us find Catrine McGregor, who used to be an L.A.-based casting director and then she moved up to Idaho. She casts a lot of people out of Salt Lake and Boise. She helped us find a lot of talent. And then it was just word of mouth. We'd meet somebody and then we'd hear about somebody else through them and follow up on it. There wasn't any one way that we went about coordinating everything; there were actually a lot of ways that we found people. It's not only the generosity of the people of Idaho; it's their friendly nature. Idaho is a friendly part of the country. Yes, Idahoans were generous but they're just good people. That's why Garry and I went back, because we knew that. We knew that people there would bend over backwards. There's also—I don't want to call it naïvete—but, a kind of innocence to the people of Idaho. They haven't had a ton of movies shot around there so it's new and refreshing to them. If they were in a place where people were bothering them all the time to make movies in this location or that location, it might be different; but, right now, it's still new, they don't get a lot of that, so everyone was willing to help. But it even went beyond that. It went from us asking, "Can you help us out?" to their asking, "What can we do to help you?" Guillén: As someone who watches probably one too many American independents, I was genuinely impressed with the professional quality of your film, especially the performances. As I mentioned to you earlier in email, I didn't detect one false note among the film's ensemble. So let's talk a bit about the casting. You mentioned that Catrine McGregor helped you secure local talent but how did you secure some of your bigger names? Pickett: Oh my goodness, I could go on about some of the casting because almost every cast member has a separate story; but, I'll start with the local people. Catrine helped us find David Stevens who played my best friend Jake. Dave came out of Salt Lake, though he does a lot of work in L.A. I thought he did a great job of adding a little lightness to the movie and humor in places where it was needed. 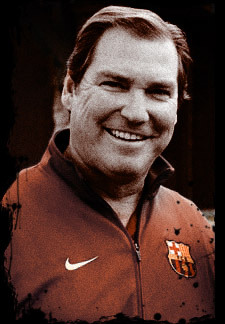 Catrine also helped us find Duane Stephens, who plays the Sheriff. Both of those guys are so professional and believable. That's what we were looking for: we just wanted honest people with honest performances. We set out to make an honest, straightforward, and heartfelt movie. We weren't trying to trick anybody or do anything too clever. We just wanted to tell a heartfelt story and those two guys fit into the cast. Choosing the right director was key. I knew we had to work within a certain budget and I had worked with Mike Feifer on a number of smaller films and was starting to get to know him. I knew that—if nothing else—if we got Mike Feifer as the director, he has a certain eye and would help us cast and help us bring the movie in on time and on budget. He was invaluable to the production. He loved the script, he loved the whole idea, and he truly loved Idaho. He gelled with everything. He was the perfect choice. 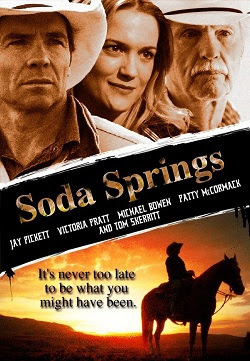 Mike has done a lot of really good films, but I think Soda Springs is the best film he's ever done and I don't think he would disagree with that. I mention Mike because he knew Michael Bowen from working with him on another movie. Michael played Larry, the bad guy. We had other guys in mind; but, again, they wouldn't have worked. Dean Cain had agreed to do it, but he didn't want to be that mean. I thought, "Well, we have to find somebody who's okay with being bad." As a character, Larry has some redeeming qualities but all in all he's the antagonist. 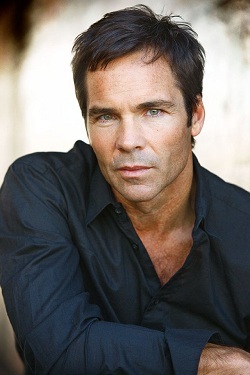 Mike came up with the idea of casting Michael Bowen and Bowen was like, "Beautiful. Perfect." He fell right in. It's not like we went out casting for all kinds of people; we found people. Michael also worked with Patty McCormack, who played my Mom, and I thought, "My goodness, this woman is incredible!" So we hired her. We didn't have an actress for the role of Shelly and there were a number of people we were considering because we wanted to get someone with a name for that role. 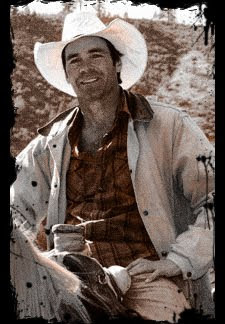 I remember driving my truck from L.A. to Idaho while on the phone with Garry and Mike and agents. Whenever I had service, we were trying to cast this role because we were going to start shooting in two or three days. Before finally reaching Idaho, we had decided on Victoria Pratt. She couldn't have been better. We went off of her demo reel and what people said about her and then she showed up on set and she was so great and gracious and fun. Things just fell into place. 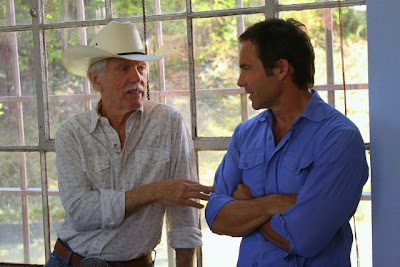 Then there's the story of Tom Skerritt. We didn't get Tom Skerritt until almost a year later. We shot our entire movie without Tom Skerritt. Between you and me, you know the secrets of how people make films. We knew we needed somebody with a name playing that character. By sheer persistence and not giving up and dealing with agents and managers and on and on and on, we were finally able to land Tom Skerritt, which was one of the best things that happened to our movie. Guillén: Skerritt's performance is the true broken heart of Soda Springs. It's one of the best things I've seen him do in a long time. He's always been one of my favorite performers, as far back as his TV work in the '60s and the '70s and then, of course, as Dallas in Alien (1979), but I hadn't seen him in a while and to see him come forth with such a heartbreaking portrayal was welcome. Pickett: Yeah, he showed up and delivered. Guillén: Another veteran actor who you had on hand was Henry Darrow as El Quijano. There are some poetic flourishes in Soda Springs I'd like to address and the character of El Quijano is one of them. He's a mysterious figure. At times I wasn't even sure if he was flesh and blood or whether he was just a guiding spirit. Pickett: Michael, God bless you because that's exactly what I wanted him to be. When you say "guiding spirit", you totally get it. I wanted to leave this up to the audience's imagination. What is this guy? Is he real? Is he a spirit? Is he long past? In the movie we suggested he might be a relative of Sonya (Hollis Welsh) but the audience still doesn't know if he's alive or dead or if she even knows he's around. I wanted each individual audience member to come up with their own idea of who he could be. Guillén: The ambiguity around El Quijano is one of the film's poetic flourishes. As I thought about it, the membrane between the corporeal and the incorporeal kept thinning. According to the continuity of the narrative, El Quijano not only interacts with Eden but also (off camera) with Jake. He's entrusted Eden's father's guitar to Jake to hand back to Eden. As a guiding spirit, he then became not only a guiding spirit to Eden but, in a way, to Jake as well. Or rather, one could say he became a guiding spirit to the narrative. Guillén: I think why that further touched me is because it speaks to the nature of Eden's friendship with Jake. Why I enjoyed David Stevens' portrayal was because he reminded me of my childhood friends from Idaho who are still my friends, some 50 years later. Jake is an almost archetypal friend who exemplifies the kind of people I've had the good fortune to meet in Idaho. In my own personal mythology, the friends I made as a child in Idaho have remained my friends throughout my life, whereas so many others have come and gone. There is a constancy to their spirit, which again speaks to that guiding ethos within El Quijano. Which leads me to the film's overarching (and classic) theme of atonement, of the relationships between fathers and sons, of mentorship, and of Eden's particular sacrifice for Sonya, which is revealed late in the narrative. Why was this theme of atonement important for you to express? Pickett: Y'know, I'm not even exactly sure, Michael. The script has, of course, evolved into something almost completely different than how it started out; but, even in early versions of the script, I wanted an element of atonement and forgiveness. That was essential to what I wanted to say and get across. I also wanted to suggest that—with regard to fathers and sons—everything doesn't have to be passed down the line. Somebody along the way can make a change. Guillén: Sons need not necessarily inherit the sins and the sorrows of their fathers? Pickett: That's right. Somebody along the way can break the chain so that things don't have to remain the same. By breaking the chain you change things not only for the future but even into the past. Guillén: The past is never finished. The past influences the present, the future, and doubles back to influence itself. Why these themes interest me is, perhaps, because I was a student of the mythologist Joseph Campbell who often spoke of atonement ("at-one-ment") and who told me many stories about atonement, which were frequently about sons coming to terms with their fathers, or becoming one with their fathers. I remembered those stories while watching Soda Springs. Another poetic flourish that caught my eye watching Soda Springs was during the sequence where Eden finds the photograph of himself as a child with his father. It looked like a baseball photo and instantly reminded me of the photograph you have up on Facebook of you and your son Tyler, also at a baseball game. Pickett: That's funny. I'm sure people do recognize that. We photoshopped that Facebook photo with Tom Skerritt. Guillén: So it actually is that photo from Facebook? Pickett: Again, Soda Springs was my own movie, Michael. 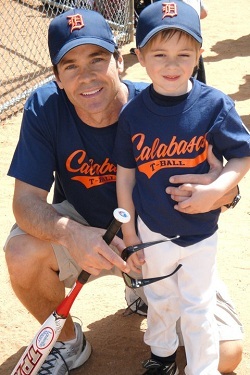 I brought Tyler to Idaho on the day we were shooting the baseball stuff and he was too little. He didn't want to sit in the stands long enough so I could get a shot of him in the movie so I thought, "You know what? I want my son in the movie somewhere." Especially because of the themes we're dealing with in the movie. That was my way of getting his little mug into the picture. I took a little license and put him in there. I'm okay with it. Guillén: It's a beautiful gesture. I'm interested in why you decided to go direct to DVD? If I'm not mistaken, you did have a premiere screening at Boise's Egyptian Theater this past summer? Guillén: I was out of town at that time but would have enjoyed attending that screening. But other than for that screening at the Egyptian and a few festival screenings, you've decided to skirt theatrical and go directly to DVD distribution. Pickett: First of all, a couple of things. Yeah, I would have loved for you to have been at the Egyptian because it was truly an amazing experience. We filled the theater and the audience absolutely loved the film. Michael, not everyone gets the themes in the way that you get them. I'm also a fan of Joseph Campbell and have read his books on the hero's journey. In my own unique way, I wanted to follow that structure; but, not everyone gets that. We weren't able to muster up enough of a buzz to justify a theatrical release unless we self-distributed, did it ourselves and took the film around to different theaters. We weren't up for that. Pickett: It's a lot of work. We put a lot of money and time into getting the film this far. I'm just hoping that with people like you who see the depth of this story—because there is more depth to this story than meets the eye—maybe we can create a kind of grass roots buzz and by word of mouth do well with DVD sales and on cable. We'll be on movies on demand also. Guillén: IMDb lists two new projects you've just completed. You have a direct-to-video release from 2009 called The Real Deal and another project with Soda Springs director Michael Feifer called Unstable (2012). Can you speak a bit about those? Pickett: The Real Deal was an educational feature film from Loyola Productions that they turned into a whole series of workshops and classes. I think it's a movie they use in-house and I'm not even sure if it will ever be available. I finished Unstable a few months ago with Ashley Scott and Ivan Sergei. I had a nice role in there, played a good guy, played the guy who ends up with the girl in the end. I really liked the script. I haven't seen the movie yet; but, I was happy with what I saw in the days that I was there. So we'll see what that one does too. Guillén: In terms of your own writing and producing, you've started with Soda Springs but what can we hope to see from you in the future? Pickett: I have a few different things in the air and we'll see what sticks. 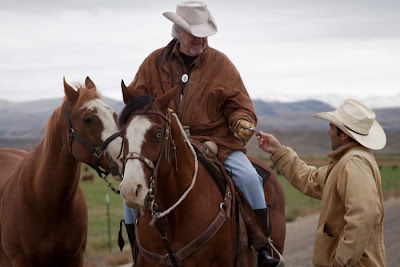 From another film festival, I'm working on a script with a guy out of Kentucky who loved Soda Springs so much that he showed me a script he was working on about an ex-rodeo rider who's down on his luck but gets a second chance through horses. I'm also working on another script about bull riding, which is kind of like Rocky meets 8 Seconds meets The Rookie. And then I got a nice Christmas story from another guy, so we'll just see. I'm trying to find the next logical project that makes the most sense. Guillén: Well, Jay, once again I'm sorry I don't get to meet you in Sun Valley. Have a wonderful festival experience there. Pickett: You've been so kind and gracious, Michael. It makes me feel good when somebody gets what we tried to do. It warms my heart like I cannot tell you. Guillén: I appreciate that, Jay. Thanks again for your time today. Of related interest: Jay Pickett's IMDb Demo reel. 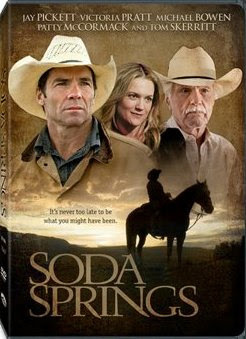 For those unable to attend the SVFF screening, the DVD for Soda Springs is available for pre-order on Amazon. The release date is March 27. It will also be available on Movies on Demand March 27 and in Wallmart stores this May. 04/21/12 Update: Soda Springs won Audience Favorite at the recent Sun Valley Film Festival. Here is Dan Delago's Examiner interview with Victoria Pratt. Also Soda Springs will screen at the opening night of the 2nd annual Idaho Cineposium, sponsored by the Idaho Film Office in association with kNIFVES (Northwest Independent Film Video Entertainment Society). Jay Pickett and executive producer Gary Hollie will kick off the event at Silverwood Theme Park's theater. The conference continues Saturday at the Coeur d'Alene Inn with great keynote speakers, panel discussions, and time to network with speakers and industry peers. In his sophomore feature The Forgiveness of Blood (2011), Joshua Marston continues his immersive style of American independent filmmaking, positioning his penetrating narratives within the cultural context of foreign locales. His first film Maria Full of Grace (2004) was set in Colombia and made a star out of its lead actress Catalina Sandino Moreno, earning her multiple accolades, including a Best Actress nomination at the Academy Awards®. His follow-up feature situates itself in Albania and explores the threat ancient traditions pose to modern youth. Winner of the Silver Bear for Best Screenplay at its world premiere at the Berlin Film Festival, The Forgiveness of Blood has now opened theatrically. Per the film's official synopsis, The Forgiveness of Blood "focuses on an Albanian family caught up in a blood feud. Nik (Tristan Halilaj) is a carefree teenager in a small town with a crush on the school beauty and ambitions to start his own internet café. His world is suddenly up-ended when his father and uncle become entangled in a land dispute that leaves a fellow villager murdered. According to a centuries-old code of law, this entitles the dead man's family to take the life of a male from Nik's family as retribution. His uncle in jail and his father in hiding, Nik is the prime target and confined to the home while his younger sister Rudina (Sindi Laçej) is forced to leave school and take over their father's business." Joshua Marston is the writer and director of Maria Full of Grace (HBO Films/Fine Line Features). The film garnered numerous awards, including the Audience Award at the 2004 Sundance Film Festival, Best First Film at the 2004 Berlin Film Festival, the 2004 Independent Spirit Award for Best First Screenplay, and the aforementioned Academy Award® nomination for Best Actress. He recently directed the Coney Island section of the feature New York, I Love You starring Cloris Leachman and Eli Wallach. In addition, he has directed episodes of Six Feet Under (HBO), How to Make it in America (HBO), In Treatment (HBO), and Law & Order (NBC). Mr. Marston received an MA in Political Science from the University of Chicago and an MFA in filmmaking from New York University. He has been a recipient of the New York Foundation for the Arts Fellowship and of residencies at the MacDowell and Millay artist colonies. Marston's films were recently added to MoMA's permanent collection. My thanks to Christine Slaton of Allied-THA for facilitating my conversation with Marston. The Forgiveness of Blood is currently screening at Landmark's Bridge Theatre in San Francisco and will shift to The Flicks in Boise on April 6, 2012. Michael Guillén: Joshua, I feel a need to preface our conversation today with something of an apology. As I was doing my preparatory research, I realized you have been interviewed about 5,000 times for Forgiveness of Blood so please bear with me if we cover similar territory. Joshua Marston: All part of the job. Guillén: I'm hoping we might steer our conversation towards a research project I'm working on regarding the pros and cons of the category of "national cinema(s)", which I believe you are uniquely suited to comment upon because of your particular style of immersive filmmaking; a style that contests and—in some ways—thwarts the tropes of national cinemas. Guillén: You are an American director who—through a set of economic circumstances not completely under your control—has ended up working outside of the United States. You first created what was considered a Colombian film (Maria Full of Grace) and now an Albanian film (The Forgiveness of Blood). Naturally, this leads me to question the nature of American independent filmmaking and to ask you if you have a sense if American independent filmmaking is in itself a kind of national cinema? Marston: American independent filmmaking is so diverse that I wouldn't know how to characterize it in terms of its style. There are subcategories. Within dramatic narratives there are the quintessential Sundance comedies and mumblecore films; but, I don't know what makes American cinema "American", per se. Guillén: Other than, perhaps, the difficulty of making independent films in America? Marston: Is it more difficult? It's more difficult only insofar as there are no federal or state subsidies or incentives as there are in Germany and France. But I know that a lot of European filmmakers find independent filmmaking difficult because so few movies get made and—because there's not as much of a private equity or studio financing system—they all have to compete for assistance. They feel it's more difficult to get a movie made outside the United States. Guillén: Because of the opportunity you've had to make movies outside of the United States, and your self-admitted "immersive" style of filmmaking, would you consider your type of indie filmmaking as subversive to the American style? Marston: When you talk about British cinema, you can tell there's definitely a history of kitchen sink realist filmmaking (such as Mike Leigh and Ken Loach) and you can see similar tendencies in Italian neorealism, and—whether it's Iranian cinema or beyond—you can see a real history of realist cinema. While there is some realist filmmaking in the United States, it's not as big of a tradition. Ironically, there's not been an enormous amount of realist filmmaking in the countries where I've made my films. I was told when I was making Maria Full of Grace that my film wasn't Colombian because it didn't have a black humor to it, but I wasn't interested in passing myself off as a Colombian filmmaker. I'm me. I'm the filmmaker that I am with my own personal sensibility because of the movies that I've been inspired by, which happen to have been more realist cinema. That's why Maria Full of Grace stood out in Colombia. The same is true in Albania, I think. A lot of the people in Albania who saw Forgiveness of Blood felt they were having a cinematic experience they hadn't had before because they don't have a tradition of realist cinema. Guillén: You come from a journalistic background. Do you feel that background has provided the documentary impulse to this realist style? Marston: Absolutely. I've spent a lot of time living abroad and having cultural experiences dating back to my teenage years. I had the opportunity to spend a summer living with a French family, another time with an Italian family, and spent some time in Mexico. These experiences made me interested in and curious about the ways other people live. Living in a foreign culture is a bit like living in a puzzle. You're constantly being presented with things to figure out, whether it's just the language or local traditions or ways of thinking and I find that very stimulating. That actually made me want to figure things out and that's where that sensibility overlaps with the journalistic sensibility: the desire to understand how the world works. What's weird about the way I work is that I take all of these interviews and turn them into a fictional story that on the one hand makes you feel like you've been there and that you're in a real environment but on the other hand gives you an emotional ride that you might not otherwise get from straight journalism. Guillén: I appreciate how you've phrased that. Several critics have said, yes, you immerse yourself in the countries where you film, you conduct your journalistic research, and you authenticate your films through the thoroughness of your research so that—as you say—audiences feel like they've been to these countries and directly experienced these cultures; but, even a journalist can be flippant in how they approach a foreign country. You insist upon authenticity but meld it with generic tropes. I'm aware you don't think of Forgiveness of Blood as a thriller, yet the story has the nail biting affect of a thriller. Is it your American sensibility that lends that generic trope to the work? Marston: That's a really good observation. It helps that I am very attuned to narrative storytelling and to how the story is progressing. I'm conscious of what the dramatic question is underlying the narrative that keeps the audience from getting up to go to the bathroom. That may well be because I'm an American filmmaker and—I guess you could say—conventional in that respect. I want to tell a story that is dramatic and that keeps the audience emotionally invested. Guillén: At Screen Daily, Mike Goodridge complimented the balance you've struck between immersion and distance. He wrote: "Marston's foreign nationality helps to bring a valuable external perspective to the material, however immersive his process in the society he is covering. A local film-maker might be less able to step away from the subject matter with such clarity of vision." Marston: I hope that's true. 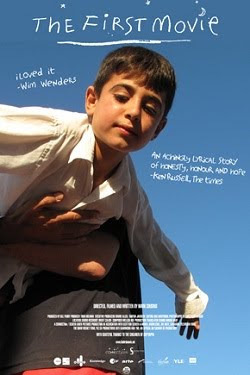 I can tell you that there have been other movies about blood feuds in Albania, but I was interested in something larger or deeper; that is, a story on one hand about kids growing up and on the other hand a story about a society in transformation. Fact is, the society in transformation creates all these unusual and fascinating juxtapositions, like someone delivering bread in a horse-drawn cart while using a cell phone, or someone stuck in a house during a traditional blood feud playing video games. 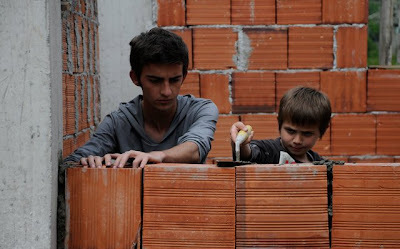 Those are the sorts of things that I was looking at that maybe Albanian filmmakers—because they're already living in this society—are not necessarily trying to paint a larger picture of the society and the transition they're going through. I might come at it with a different, slightly broader and more incisive point of view. I hope. Guillén: Of the many write-ups I read on Forgiveness of Blood—the one that was key for me in providing the most insight into your particular stylistic integrity—was your fascinating conversation with Braden King for Filmmaker magazine. In your conversation with King you spoke about having to negotiate rivalries within Albania just to accomplish the production of the film. That sense of rivalry certainly came to its pointed little head with the whole Oscars® controversy. Are you willing to talk a bit about that? Guillén: Having weathered that experience, I guess I would first want to know what you consider to be a national cinema? How would you define it? And has AMPAS failed in correctly defining the category of a national cinema? Marston: Well, there's only one basic relevant defining factor, I think, as far as the Oscars® are concerned and that is that there is a selection committee that resides within each country that chooses the film that it wants to represent their country. I believe that how that committee functions and hashes out which film it wants and whether or not a film is indicative of their society ought to be left up to the members of that selection committee. I don't believe that Hollywood or the Academy's executive committee has any place in dictating—in this case—to Albanian filmmakers what is or is not considered Albanian. If you're going to dignify a country with the status to enter the race, then you have to respect that country's self-determination. If the Albanian film committee looked at Forgiveness of Blood and said, "Yes, we understand that the director holds an American passport; but, for x, y and z reasons we believe that this is definitive Albanian cinema and we want to submit it", I don't think the Academy has any business overruling that or trying to know better what is or is not Albanian. It's disrespectful to a country and its filmmakers to meddle in their decision-making process. Guillén: In a conversation I had with film historian Thomas Elsaesser, he noted that there's a cynicism that creeps into the marketed definitions of certain national cinemas. He complained that the foisting of the concept of a national cinema upon the filmmaking practices of Eastern European countries, for example, ignores the contemporary reality that filmmaking has become much more of an international enterprise. The concept of a national cinema needs to be more flexible—or be discarded altogether—in order to accommodate such an evolving reality. Marston: At the end of the day it's a logistical choice. The Academy thinks, "We can't possibly watch every foreign movie that is made within a 12-month period." They need some way to limit all of those movies and so they choose to categorize films by country; but, the truth of the matter is that they categorize movies by country because of the notion of a national cinema: that there is a French cinema and an Italian cinema. Such categorization—though frequently validating—is increasingly irrelevant. It's in those instances where it's irrelevant that it's a shame that those movies become ineligible. The main reason it's a shame that they become ineligible is—not because winning a statuette is often the end-all of a filmmaker's career—but because being nominated for this award gives a filmmaker a greater audience. That's the shame. And it's ironic because the establishment of the award is supposed to be this good-natured, good-hearted, open-minded account to open American audiences up to foreign films, asking them to consider these movies as well and to get at least a handful of movies on the map and positioned so that American audiences will experience them. It's all ostensibly in the interest of cross-cultural understanding, right? But it's the movies that are precisely cross-cultural, that have no specific national home, that are the ones that fall through the cracks. That's tragic. I will say one other thing about national cinemas that was a learning experience for me. When we were trying to figure out how to finance this film, we went to Cannes and had a bunch of meetings and, happily, were put in touch with Domenico Procacci who was the producer on Gomorrah (2008). The majority of the money for this film came from European funding and the reasoning behind premiering the film at Berlin was because it felt like a European film, not only because of the financing but because it's an Albanian story in the Albanian language. The assumption was that it would sell well in Europe, that it would help Europeans put Albania on the map, that they would become curious about Albania and then enter into the conversation about extending the European community. While I was there, Albania entered NATO and was still looking forward to becoming a member of the EEC. In Europe, they're used to watching movies in subtitles so I figured the film would do well no matter if the language spoken was Albanian and the subtitles were in German or Slovenian or whatever. But I was shocked and surprised to discover that all European films are not equal, even within Europe. I attribute that to the fact that when you go to sell a movie—even if you're selling an Albanian film to Germany and France—it's not all the same. When you say on a Saturday night, "Hey, honey, do you want to go see the new French film or the new Italian film or the new Spanish film or the new German film? "—that evokes a connotation of a national cinema and a whole genre. That is a selling point when you have a film on the market. Sadly, when you say, "Honey, do you want to go see the new Albanian film? 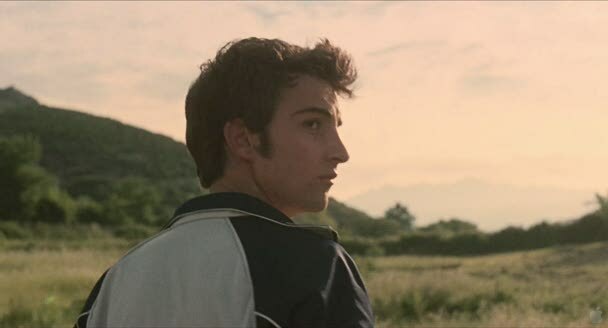 ", it doesn't necessarily evoke the same warm fuzzy feelings that you get from a new French film or a new Italian film, even though European audiences will be reading subtitles, whatever film they go to see. Even within Europe there is stereotyping and prejudice that goes on by virtue of which movies come out from what given country and what associations they have. Guillén: Fascinating. I know Jonathan Rosenbaum has cautioned against the economic hierarchy of national cinemas, so I appreciate hearing you express this as well. Early on in the process, shortly after you'd finished the film, in some of your first interviews you expressed concern over whether Albanian audiences would accept your interpretation of the blood feud and how you had chosen to humanize the issue and make it more intimate. Clearly, because it was the Albanian selection committee's first choice for the Academy Awards®, Forgiveness of Blood ended up being appreciated by Albanian audiences on your terms? Marston: Yeah. 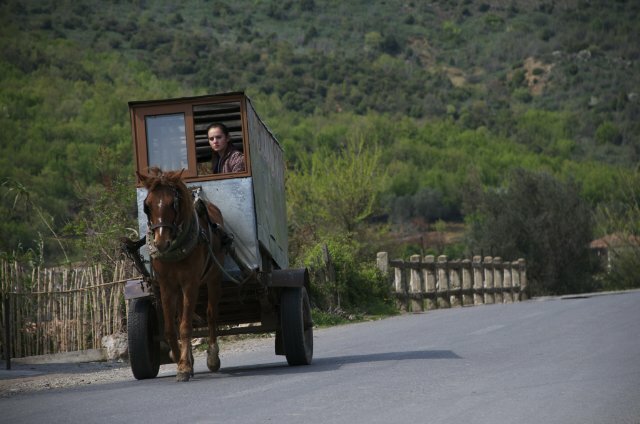 It broke all box office records in Albania and, in particular, a large number of teenagers went and saw the movie, which is not the usual demographic in Albania that goes to the movies, surprisingly enough: they tend to watch movies on satellite TV and the internet. It was exciting that kids were going to the theaters to see this movie about the experience of kids their own age and really responding and embracing it. That was reaffirming. Guillén: Forgiveness of Blood practices a parallel narrative structure between the coming-of-age stories of both the brother and sister. 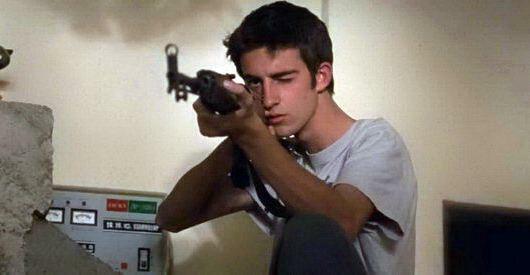 While watching the film, I kept noting how the boy's coming of age was reflected in the way he looked into the mirror. Can you speak to how you applied that metaphor? Marston: That's a common device for a character reflecting on themselves. Those moments in the film are specific junctures where the character is faced with a difficult dilemma. It happened at the beginning when the film establishes the base line of who he is and, ironically, you could say he's defining his identity just insofar as whether he wears his sleeves up or down. Then later when he's looking in the mirror he's at a point where he has to decide whether he's the type of character who stays and fights or runs and finds some kind of freedom for himself? He has to make his mind up what he's going to do. So the mirror provides these moments for the character to reflect and define himself. Guillén: I also appreciated how you used multiple screens within screens; for example, the TV screens within the movie and, more specifically, the cellular video messages that were being displayed. What were you thinking of there? Marston: Yes, there were definitely screens within screens, but for me the main thing that was happening was the level of communication and also the presence of technology in the midst of an antiquated tradition. One of the greatest impediments to these feuds getting resolved is that there are limited levels of communication between one family and another. When a feud breaks out, the family of the killer will send a mediator or a group of mediators to represent them and ask for forgiveness. That happens repeatedly. It might happen every few months over a period of years. The feud may go for a year or even a couple of years without being able to assemble a group of representatives and so it becomes difficult to communicate with the other family. The irony now is that communication could be very easy. It could be as simple as sending an email. But, it's not so easy because there are other factors involved besides technology. You have to consider the timing of when you try to reach out and communicate. And then, of course, it's often the fact that what happens in these feuds is that the families become isolated—not just from the family they're feuding with, but all the society around them—so we were able to consider: "Well, in what ways can a kid today try and fight back against this tradition of yesterday?" One of the ways is that he can use present-day technology to, at least, penetrate the isolation. Guillén: In one of your interviews, you relayed how you actually brought laptops to some of the young kids under house arrest so that they could, at least, reach out to members of their own family. I found your commitment commendable. You're committed not only to telling the story but to be fair and forthright with the people you're interacting with; I admired that. Marston: That's, again, the difference between being a filmmaker and a journalist. There's not the weird constraint that can be placed upon journalists where they're not allowed to assimilate and help the people they're interviewing. Journalists often find themselves in this strange quandary where they feel that—if they give financial or material help to the people they're interviewing—they compromise their objectivity. Whereas, my opportunity to help comes from more of an emotional truth. Guillén: I likewise admire your sense of responsibility for turning non-actors into actors. You feel a certain responsibility to what's going to happen to them next, having exposed them to this form of self-expression? Marston: For better or worse, right. After this film the lead actor Tristan Halilaj who played Nik decided to make a career out of acting. He's now in his second year of acting school in Macedonia and his main professor is Refet Abazi, the actor who plays his father in the film. Guillén: That's fantastic. Do you have any kind of ensemble aesthetic as a director? Now that Tristan has trained as an actor, would you consider working with him again in another narrative? Marston: It would have to be the right role. I have an ongoing joke with Catalina Sandino Moreno, the lead actress from Maria Full of Grace, about which one of us is going to get the other one work. She says if she gets me a job as a director, I have to hire her as an actress. Guillén: [Laughs.] How funny. Now, just to make sure I understand the ending of your film a bit better, your two young actors were marvelous, you brought them along to accomplished performances, but I wanted to make sure that I understand what it means that the boy has to leave home. He's given the chance to live in exile to pay the debt; but, living in exile is, in effect, the same as his being murdered. Is that correct? Marston: The mother makes that equation, yeah. Guillén: Is the blood feud then resolved by his going into self-imposed exile? Marston: No, the blood feud is definitely not resolved. The patriarch of the opposing family said very clearly that—while they won't seek out Nik—if they spot him in front of his family house, they will kill him. Guillén: Is his younger brother still in danger? Marston: When he comes of age, yeah. Guillén: How are we meant to read his sister's face in that final close-up in the film? Her expression is mysterious. Can you speak to that? Marston: Well, it's perhaps mysterious, but I would hope it is complex, in the sense that she's feeling a stream of emotions. On the one hand, she's grieving the loss of her brother and feeling that, in some ways, her family is being chipped away at; but, on the other hand, there is hopefully a mixed blessing or silver lining to this story in that she has been strengthened by all that has been put upon her. You have the sense that—even though she's been left behind to take care of things—there is some hope in the notion that she is a strong, young woman. She'll be able to fend for herself and for her family, regardless of what happens. That final moment is meant to be bittersweet. Guillén: You've become associated with working with non-actors and yet this is not necessarily exactly what you want? You have worked with professional actors as well, such as in your segment for New York, I Love You. Can you speak to the difference for you as a director to work with non-actors as opposed to professional actors? Marston: Well, the truth is that in both Maria Full of Grace and The Forgiveness of Blood there are several trained actors working with the non-actors, moreso in Maria Full of Grace but there are a half dozen trained actors in Forgiveness of Blood as well. In some respects, I appreciate what Ken Loach has said that there's no difference between a non-actor or untrained actor and a trained actor. Everyone's an actor in a film and, as the director, you're dealing with the emotional substance of a scene that you have to shoot on any given day. In the same way that the director's job among trained actors is to figure out the language that the actor responds to best, if you're dealing with an untrained actor you're doing the same thing: you're figuring out what language this person will respond to and just because someone's had formal training doesn't mean that they're going to be easier to work with. It just means you might use a different language. In that respect, it's just one large universe of different languages that a director uses to speak to his performers. The one thing that I will say is that in places like Colombia and Albania there is one strong tendency that predominates in each of those places and it tends to be more melodramatic in approach, in contrast to the United States or Western Europe where there are a lot of different schools of acting and a real diversity in approach. In Colombia there are a lot of telenovelas and in Albania it's broad theatrical acting. There, the advantage of a non-actor is that they're going to be a little bit more realist in their approach. Guillén: How do you negotiate between your professional actors and your non-actors to achieve a uniformity in tone? Marston: Well, that's my job as a director. Even though everyone is coming from a different place in terms of their training or the language that they respond to. But I have to give credit to the trained actors in this film who helped to coach and guide the young untrained actors. Refet Abazi who plays the father and Ilire Vinca Celaj who plays the mother are both acting professors. They helped me to help the kids feel comfortable and to find their moments in the script. Guillén: You mentioned that Tristan has decided to pursue an acting career. Has Sindi decided to do so as well? Marston: Not yet. She's still in high school so I don't think she's decided what she wants to do. Guillén: Now that The Forgiveness of Blood has opened theatrically, can you look back on its film festival trajectory and cull out what were some of the key moments for you? Marston: Obviously some of the better moments were getting the Silver Bear at Berlin and having the open-air screening at Saravejo, which—partly because of the nature of the number of people and the historical context of how that festival came into existence—makes that festival a very special place to bring a movie. The one other highlight for me would be Telluride, which is a festival that I brought a short film to back when I was still a film student. I was so enamored of the festival that I've been back as a spectator just about every year. I had one other short film show at Telluride, but I wasn't able to bring Maria Full of Grace because it premiered at Sundance. The best outcome of having The Forgiveness of Blood premiere at Berlin was that it allowed Telluride to be the film's North American premiere.